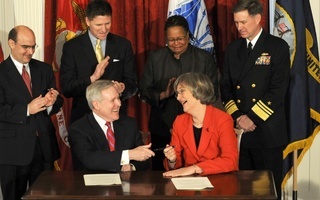 After a more than forty-year hiatus, University President Drew G. Faust announced last Friday that Harvard will officially recognize the Naval Reserve Officers’ Training Corps. Earlier this fall, Faust had publicly stated that Harvard would welcome ROTC back on campus if “Don’t Ask, Don’t Tell”—a controversial law that banned openly gay citizens from serving in the military—were repealed. We commend the president for keeping her promise and reiterate that the time has come for the University to put a formal end to the outdated stigma it has for so long embarrassingly assigned to students who wish to serve their country. Even though ROTC remains a divisive issue on campus, its return is now a reality, and the program as a whole will be recognized as a valid student organization eligible for funding and logistical aid from the University. This latter point is especially important given that—even with recognition—Harvard ROTC recruits will still continue to train at the Massachusetts Institute of Technology. In short, now that ROTC is set to become an official presence on campus, the University must take immediate action to ensure that the program and the undergraduates who choose to participate in it can be better incorporated into our community. They deserve no less. One way this can be accomplished would be through greater academic facilitation of the ROTC program. First and foremost, the military science courses that ROTC students are required to take should be eligible for university credit. More should also be done to add components of military history to the College’s history course offerings at large, very few of which deal with topics relating to military history. These additions and changes might help to eradicate the very real stigma that ROTC students feel at a place like Harvard—nominally committed to open-mindedness but in reality caught in prejudices of its own. In other words, it is one thing for the University to recognize ROTC; it is another for it to afford the program the support it needs to thrive. Undergraduates enrolled in ROTC’s programs for whatever reason should never feel they have something to hide, and the University must ensure that all its students—regardless of their interests, values, and beliefs—are afforded the same amount of respect and tolerance. On that note, it might seem hypocritical to urge the University to increase tolerance for one group of students by recognizing an organization that excludes another sector of the Harvard community. After all, even though the repeal of DADT will permit openly gay citizens to serve in the military, transgender and intersex individuals are still prohibited from service, and ROTC would similarly prohibit Harvard’s transgender and intersex students from participating in its activities. Harvard also has a Non-Discrimination Policy, which states that any form of discrimination “based on race, color, sexual orientation, gender identity, religion, age, national or ethnic origin, political beliefs, veteran status, or disability unrelated to course requirements” is inconsistent with the principles of the University. Given those facts, some may wonder how the return of ROTC can ever be justified. Essentially, we believe that the military’s current discriminatory policies are deplorable and should be abandoned. There is no conceivable reason for the United States to deny certain citizens the right to serve their country, especially when countries such as Spain, Norway, and New Zealand have already passed legislation that welcomes transgender people into the armed forces. For the sake and conscience of all Americans, the United States military must be made to do the same. To that end, we also believe that the most effective way to eradicate discrimination within the military is through the involvement of progressive and powerful institutions such as Harvard. Indeed, that America’s preeminent universities have turned their backs on the military for so long may be part of the reason their progressive values are nowhere to be found within its ranks. In order to see those values translated into realities, the answer is not to continue spurning the military but to embrace it and to seize an active role in reforming it. In the spirit of the Edmund Burke, who famously wrote that no one “makes a greater mistake than he who does nothing because he could only do a little,” Harvard should recognize ROTC in the attempt to reform from within a system with a major institutional flaw. We would all benefit from a more tolerant military, and, in true Burkean fashion, recognizing ROTC—rather than rejecting it—seems the most promising route to accomplishing that necessary goal at this point in time. Now that Harvard has welcomed ROTC back on campus after the repeal of DADT, the University should do everything in its power to inspire that reform from within. Harvard’s administration should feel obligated to deliver on its promise that no student should face discrimination of any kind. In conclusion, it seems odd that the student body as a whole was not involved more in the process of reinstating ROTC. Harvard’s boycott of the program has proved a highly incendiary subject for many years, one that many students continue to feel strongly about. Although ROTC students were consulted in advance of the recent decision, there is an obvious interest in discussing this issue throughout the student body. Had more students been involved and invested in the decision-making process behind this recent and momentous move, much of the controversy might have been better handled.